I never intended to review this, but here it is. Recent sales of strawberries and bananas left me with enough of both of these I-couldn’t-pass-up-a-bargain items, that I didn’t really know what to do with them before they ended up in the trash. The combined daily problems of life were solved when the thought of a yogurt smoothie entered my head. Having noticed from past trips that Trader Joe’s sells quart packages of yogurt, I took a trip to the dairy case in search of a large inexpensive quantity of yogurt for the smoothies. I found what I needed, but didn’t expect to find how good this is. Since I was adding the flavor to the smoothie in the form of the fruit, I needed a plain yogurt. 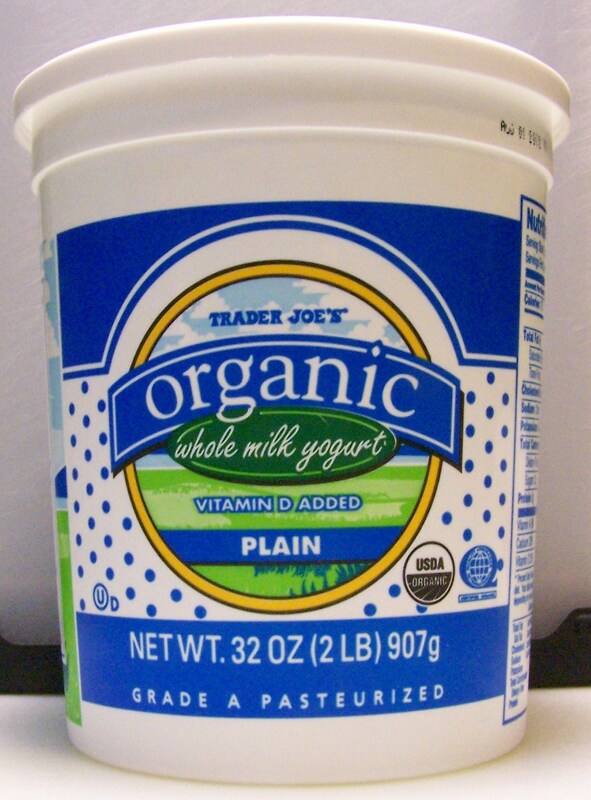 Unlike most supermarkets, TJ has plenty of plain yogurt, and in large sizes. 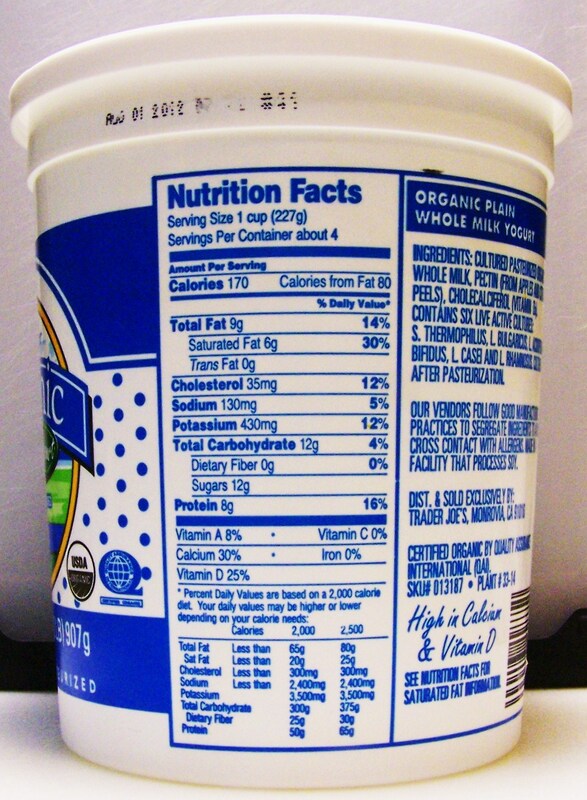 Just about all the large sizes of yogurt were also labeled organic. That was an added bonus, even if I didn’t really care. The organic label didn’t really even add much to the price. It was a done deal. Naturally, before making the smoothie I had to sample the yogurt. I wasn’t expecting much as I’ve never been a plain yogurt fan. I suppose I’m not alone in that, as about 99% of all yogurt on the supermarket shelves are flavored and sweetened. But this stuff was good. Even without adding flavor and sweetness, this was enjoyable. I don’t know why. There was just a hint of natural sweetness in the taste and not very much tartness. The texture was velvety. If you look at the picture, this is a whole milk yogurt. TJ also sells the yogurt made with reduced fat milk. Haven’t tried that one. 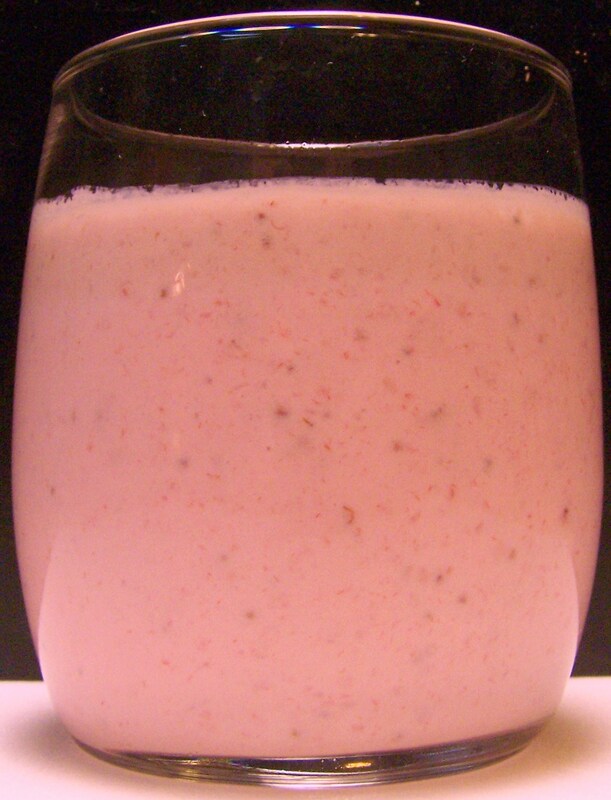 The strawberry-banana smoothie turned out just fine. Here’s a link to the recipe. Velvety, good, organic, not expensive, all add up to a new place to buy yogurt. Trader Joe’s. This entry was posted on 07/04/2012 at 09:04 and is filed under Recipes, food, cooking and related items, Trader Joe's. You can follow any responses to this entry through the RSS 2.0 feed. You can leave a response, or trackback from your own site.